JJ Grey & Mofro perform "Georgia Warhorse" at the State Theatre. A review of the show is available at the MyJoog Blog. This episode of MyJoogTV features our new favorite folk singer Andrew McKnight and distiller Scott Harris of Catoctin Creek Distilling Company. We discussed the distillation process for organic rye whiskey, social media, government regulation of spirits, and how McKnight and the Harris' are kindred spirits regarding the eat, drink, and play music locally. The Roundstone Rye we sampled was excellent, lighter than many bourbons, but flavorful and completely smooth at the tail. The highlight of the afternoon was listening to McKnight perform "Letter to Colonel Mosby" while sitting on an oak barrel in front of the still. At winecompass.com, we are followers of "Free the Grapes, now it's time to Free the Shine. The video is available to download for iTunes and Windows Media Player. 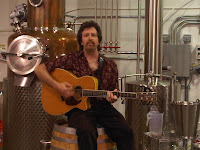 Episode 6: Andrew McKnight at Catoctin Creek Distilling Company from MyJoogTV on Vimeo. Andrew McKnight and Beyond Borders performing "These Shoes" at the Herndon Labor Day Wine & Beer Festival. Andrew McKnight and Beyond Borders performing "Worried Man Blues" at the Herndon Labor Day Wine & Beer Festival. Andrew McKnight and Beyond Borders performing "How High the Mountains" at the Herndon Labor Day Wine & Beer Festival. Ben Prestage performing Long Highway at the Boston’s on the Beach 2010 Red, White, Blues Festival. The Levon Helm Band performing at Wolf Trap. The Levon Helm Band and John Hiatt performing The Weight at Wolf Trap. The Cathy Ponton King Band performing at the Benefit for Mike Melchione (member of Grammy winning Buckwheat Zydeco band and Lost Highway Band) held at the Vienna Moose Lodge. For more information visit http://www.jimmycolemusic.com. The Cathy Ponton King Band features Dave Chappell, Billy Starks, Jim Robeson, Antoine Sanfuentes, and on occasion, Ron Holloway. Tony Joe White performing at Jammin' Java - October 24th 2010. The Tony Rice Unit at The Festy.